Janice H2O Color: Back Home from Washington! We just returned from a week-long trip to visit family in Washington. My sister Ann and I, along with her friend Carol drove to Seattle to visit the Seattle Art Museum. We saw an exhibit on Michelangelo's Judgement Day fresco-the painting on the altar wall of the Sistine Chapel. There were a few of his small drawings among the pieces displayed; it was very interesting and informative. Also saw a Calder show-fun. We had a terrific lunch at the Dahlia Lounge, visited a couple of fabric stores (for them) and made a pilgrimage to the Daniel Smith store (for me.) In addition to his own line of watercolors, the shop sells many other lines and has pretty much anything an artist working in any medium could want. I bought 14 tubes of his Prima-Tek pigments. They're ground from pure minerals and have remarkable characteristics. Several are quite iridescent, some sparkle, and some granulate so actively that you almost see the pigment drop out before your eyes! I painted samples of 12 of them-don't know how well they'll show. 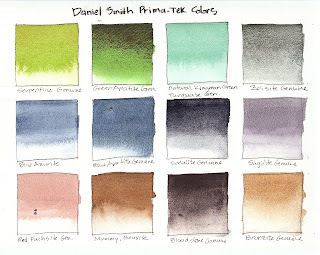 Click on the picture so you can see an enlarged view and get a better sense of how these pigments behave. There were sets that combined several tubes for a price break and my sister had a 20% off coupon!